Like much of the area, Greenwood Village's history is tied to settlers coming in search of gold. It was later developed in the 1860s and eventually became a farming community in the early 1900s. Greenwood Village resides in Arapahoe County and is now home to a population of about 13,925 residents. 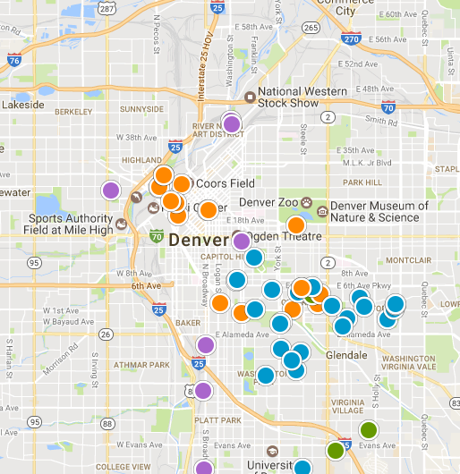 The city is located and surrounding the well-known Denver Tech Center and about 15 miles south from the heart of downtown Denver. Greenwood Village has over 15 beautiful parks and open spaces which incorporate playgrounds, sports facilities, walking trails and picnic areas. In addition, the city is within minutes from the Fiddler’s Green Amphitheatre which hosts spectacular outdoor concerts and events. Being situated only a short drive from downtown Denver lets locals enjoy the big city’s endless dining, shopping and entertainment amenities. Greenwood Village is a part of the Cherry Creek School District which is located within the city’s limits. As one of the highest-achieving school districts in the state, the Cherry Creek School District offers its students a long list of schooling options and a commitment to bettering education. The median value for a single-family home in Greenwood Village is around $998,300, which is about a 12% increase from the previous year. Home buyers looking in Greenwood Village will also find the median list price to be around $379 per square foot. Want to see the latest Greenwood Village housing market activity? Create a free custom market report for YOUR neighborhood or area!